Board index Facebook Fridays! - Free LMCCo Product Giveaways Every Week! 2016 Facebook Fridays! Good morning, and welcome to Facebook Fridays! for May 20, 2016. 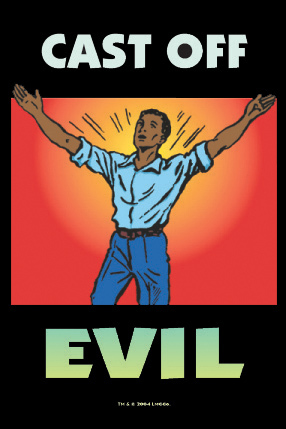 It's time to get rid of wicked people, malevolent entities, evil companions, and your own bad habits! The Lucky Mojo Curio Company is holding a random drawing to give away 4 liberating Cast Off Evil spiritual supply prizes for freedom from your inner and outer demons. 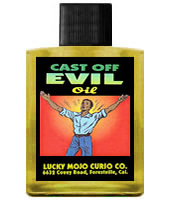 This week the prizes are 4 dressed and blessed Cast Off Evil Vigil Candles, each with a bottle of hand-made Lucky Mojo brand Cast Off Evil Dressing Oil. All you have to do to enter is to post a comment to the contest announcement on the Lucky Mojo Facebook page, Facebook Fridays! status message. First thing tomorrow morning, we will select FOUR winners at random, announce their names here, and ask them to message this Facebook Page with their mailing addresses, so we can send them their FREE Cast Off Evil products. Click the link and go to the LMCCo. Facebook page to enter -- and perhaps you will win! We have a winner! In fact, we have 4 lucky winners! Our Facebook Fridays! winners for May 20, 2016 are: Tiffany Funderburk Sellers, Gwendolyn Dillon, Laura Garcia, and Billy Ikerd. by clicking 'Message' and tell us that you are a Facebook Fridays! winner and send us your mailing address for shipping purposes. Thanks very much to all of you for participating. Watch this page for a new giveaway next Friday! Like the page and you'll receive notification of it as soon as it comes out!